My children have a branch of their paternal tree that originates in Finland. 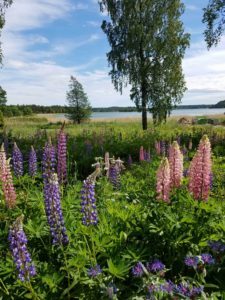 We had the most amazing trip last summer to the area just south of Vasa, Finland to see where the husband’s ancestors lived. 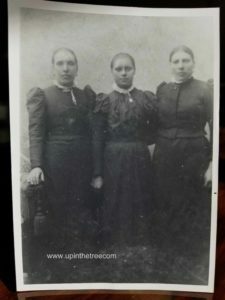 I have found several photos relating to this branch of the family. This photo appears to be a trip Wendla Batmaster took back to Finland in 1930 to visit family. It also indicates I need to look for a passenger ship manifest to find Wendla coming back to the United States in that year. 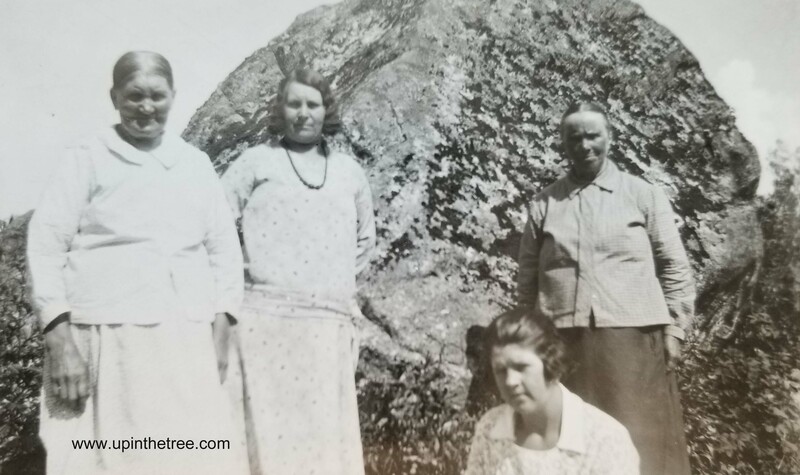 Grandma Long & her sister Anna Ostergard. June or July 1930. I am not sure who wrote on the back of this photo but I am inclined to believe it was Shirley (Gingg) Pope. This reasoning is that she refers to Grandma Long (Wendla Batmaster). Wendla Batmaster remarried after the death of her husband Charles Mattson. Her second husband was John Long. Even today, a few generations youger everyone calls her Grandma Long. It is hard for me to see Agnes Mattson (Shirley’s mom) referring to her mom as Grandma Long. Other photos Agnes owned say Mom in reference to Wendla. I am not sure how accurate this description is. Far right in the photo is Brita Maria Marander, Wendla’s mother. She lived to 81 (died 1939). This dates her to 72 years old in this photo. I do not know how old Brita’s mother, Maria Stina Alskog, lived. 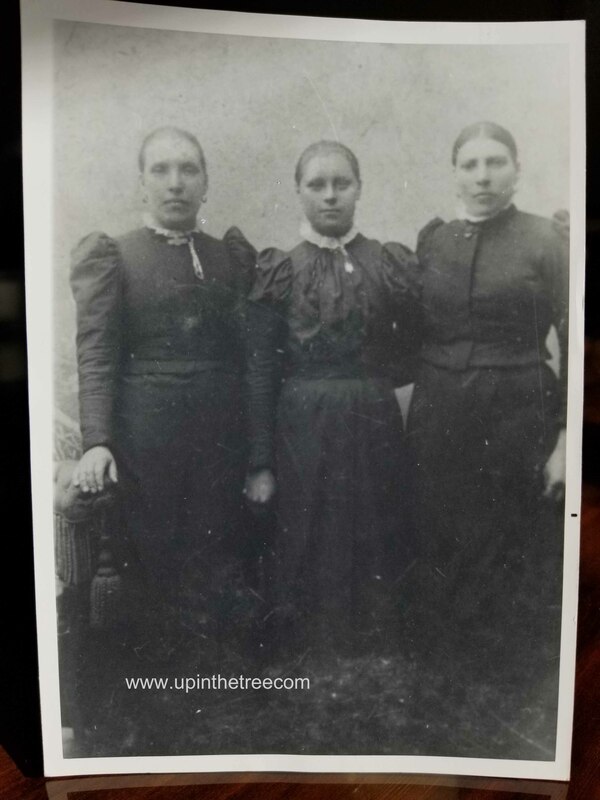 If she was born approximately 1835, theoretically, the person at the left could be Maria Stina Alskog. In 1930 she would have been 95. I am not convinced the person at the left looks 95 years old. Also the person is referred to as Great Grandma Batmaster. This points to Jonas Batmaster’s (Brita’s husband) mother, Ulrika Johannesdotter. We do know that only lived to 47. Unfortunately, I do not have any other photos of the woman at the left. I do not know who she is. There is family resemblance but I am just not sure who she is. I recently came into possession of many photos and documents for my husband’s ancestors. I will be making an effort to post these on Wednesdays to share with family. My husband has an ancestor we call Grandma Long. She was born Vendla Båtmäster in 1881 in Sundom, Finland. She immigrated to San Francisco with her brother, Isaac. Our family traveled to Finland last summer. We had the best time visiting the area where Vendla’s family lived and spending time with cousins. One aunt is Charley Johnson mother. I have confirmed that Vendla did have two aunts on her father’s side with these names. This information was found in the Finnish Church Records. Last month my family had the opportunity to travel to Finland. It was part work for my husband and part vacation travel. Our adventure started when we met up with my husband’s parents, J and S, who had been on their own vacation. 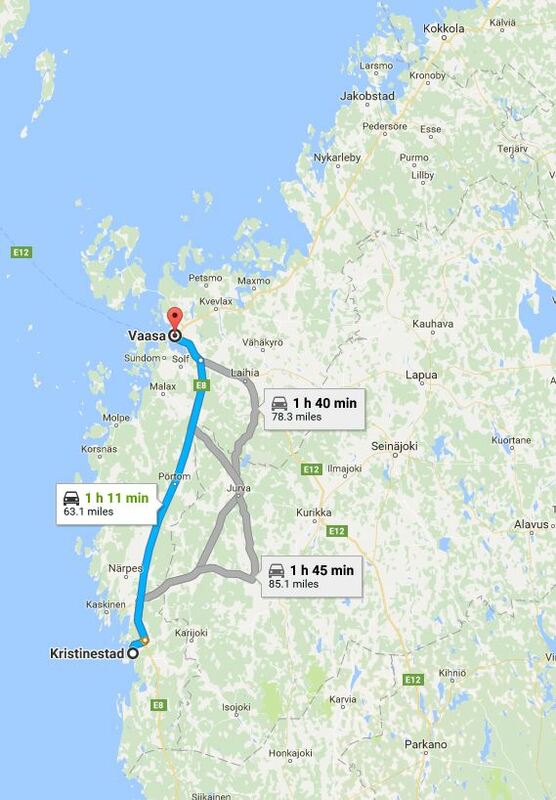 Our travel plans included arriving in a few days in the Åland Islands on our way to Finland. J was very excited to be going to Finland. 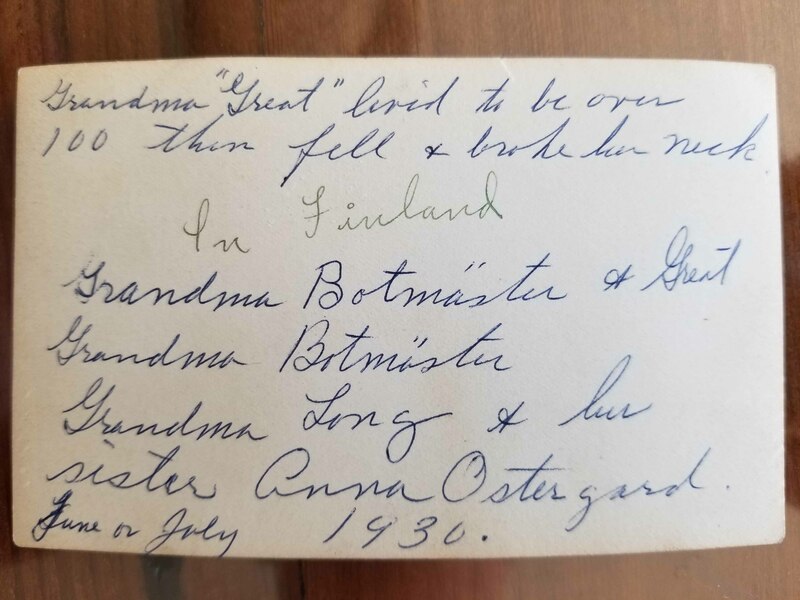 His great-grandparents, Wendla Båtmäster and Charles Oscar Mattson, had immigrated to the United States from Finland. 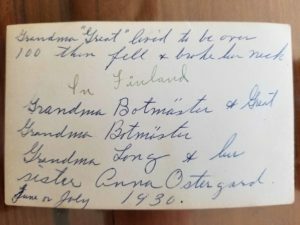 Although Wendla and Charles came from towns only 13 kilometers apart from each other, all family oral histories say they met in San Francisco through the Star of Finland Relief Society. Grandma Shirley, J’s mom, did an excellent job of documenting her family in the 1980’s and 1990’s. I am so thankful to have digital copies of her research! While she had information regarding family in Finland for Wendla, there is really no further information for Charles. Part of this is due to the fact he died the young age of 33. His obituary states he left behind (besides his immediate family) a brother, Matt Mattson, and a sister, Mrs. Lena Carlson. Grandma Shirley had also found out Charles was from the town of Malax, Finland. Basic searches for Charles did not have any positive results before our trip. I have to admit, I was not very thorough with my research due to the crazy that was the end of the school year. Back to our trip. The Åland Islands were included in our trip because Grandpa John (J’s dad) had such fond memories from the trip he and Grandma Shirley had taken 40 years ago. We arrived early in the morning after an overnight ferry from Stockholm. The morning was spent enjoying Mariehamn, the capital of the Åland Islands. We then made our way to the summer cottage my husband had found for us to stay at. It was gorgeous! Every afternoon was spent enjoying the front porch. The wifi made it one of the best offices my husband has ever used. I spent some of the porch time on my tablet trying to find more information about Charles Mattson and his family. Then it happens. I get a hit for Lena Carlson at Ancestry.com. And not just a little hit. A big, bright shiny moment of search success. It turns out Lena Carlson was just one of variations of names for Charles’ sister. And I was lucky enough to have most of them listed on the Petition for Naturalization I found. No wonder why I was having difficulty finding her! I have found Lena under every possible variation of the above name plus the additional variations using her husband’s last name, Victor. More proof the family was from Malax, Finland but again no names for Charles’ parents. So what is the serendipitous moment? About half way down the Petition for Naturalization are questions about Lena’s husband Victor. Guess where he was born? Mariehamn, Åland Islands, Finland. You will notice Åland is spelled with an “O.” This is not surprising at all since Å with a ring above it is pronounced as “oh”. Seriously, how crazy that I had traveled a little more than 5,300 miles to find a document online that says Lena’s husband was born only 10 miles from where I sat on the porch with the most incredible view? !